The Winnipeg Jewish Review does not know what exactly Rofeberg's views are (whether for example he does not believe in the right of the Jewish people to a state) since the WJR has not interviewed Rofeberg. 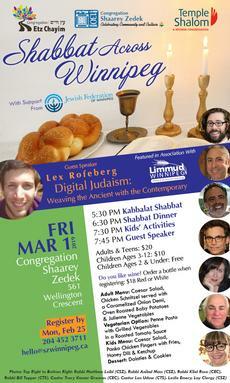 East wrote in his post Feb 23 at 9:19 p.m. " PLEASE BOYCOTT #SHABBATACROSSWINNIPEG AND Limmud Winnipeg until they remove" Rofeberg " from their programs." We have been contacted by several community members regarding a speaker with controversial ties who will be speaking at Shabbat Across Winnipeg this Friday night. When Federation was approached to be an event sponsor, we were unaware of these associations which have now been brought to our attention.